Born April 13, 1888 (1888-04-13) La Crosse, Wisconsin, U.S.
George Gund II (April 13, 1888 – November 15, 1966) was an American banker, business executive, and real estate investor who lived in Cleveland, Ohio in the early and middle part of the 20th century. Heir to the George Frederick Gund brewing and banking fortune, he was a philanthropist for most of his life. He established The George Gund Foundation in 1952 and endowed it with most of his $600 million fortune at his death. Gund's grandfather, Johann Gund, was born in 1830 in Brühl am Rhein in the independent country of the Grand Duchy of Baden (now part of Germany). The family emigrated to the United States in 1848 and settled in Illinois, but in 1854 moved to La Crosse, Wisconsin. There his grandfather founded the John Gund Brewery. His father, George Frederick Gund, was born in LaCrosse in 1856 and later managed the Gund Brewery. His father moved to Seattle, Washington, founded the Seattle Brewing and Malting Company, became a director of two banks, and then returned to the Midwest to move his family to Cleveland in 1897. His father bought the Jacob Mall Brewing Company, renamed it the Gund Brewing Company, and made a large fortune investing in banking, mining, and real estate. George Gund, Jr. (as he was then known) was born to George Frederick and Anna Louise (Metzger) Gund on April 13, 1888. He was a student at the University School of Cleveland from 1897 to 1905. He entered Harvard University, and received his A.B. in 1909. Toward the end of his Harvard education, he simultaneously enrolled in the Harvard Business School, and graduated in the school's first class in 1909. He moved to Seattle and took a job as a clerk with the Seattle First National Bank, but moved back to Cleveland when his father died in 1916. But when World War I broke out, he enlisted in the United States Army and served in the Military Intelligence Division. After the start of prohibition in the United States in 1920, Gund was forced to close his father's brewery in Cleveland. But during the war, Kaffee HAG, a German corporation, was stripped of its assets in the United States. Among its subsidiaries was Sanka, the company which manufactured decaffeinated coffee. Gund purchased Sanka in 1919, then sold it to Kellogg's in 1927 for $10 million in stock. Gund also took over management of the Gund Realty Company in Cleveland and invested his money in numerous ventures. During the depths of the Great Depression, he purchased large amounts of stock at very low prices. Gund studied animal husbandry at Iowa State University from 1922 to 1923. He made many trips to California and Nevada, often staying there for many months at a time, and became interested in a possible political career in Nevada. He purchased a large cattle ranch in Nevada, but on May 23, 1936, he married Jessica Laidlaw Roesler. She was the granddaughter of Henry Bedell Laidlaw, the founder of one of the first investment banking houses in New York City, Laidlaw & Company. Gund purchased a large home in Beachwood, a wealthy suburb of Cleveland, and the couple had six children: George III, Agnes, Gordon, Graham, Geoffrey, and Louise. In 1937, Gund was elected a director of the Cleveland Trust Company (a savings bank established in 1896), and was named president in 1941. He was made chairman of the board of trustees in 1962. Under Gund's leadership, by 1967 the bank had more than $2 billion in assets, making it the 18th largest bank in the United States. Gund also served on the board of directors of another 30 national and multinational corporations. But despite the urban nature of his work, Gund never lost his affection for the Old West. He used his income to collect a large number of works of art which depicted the American West, including works by Albert Bierstadt, Frederic Remington, and Charles Marion Russell. Jessica Gund died in 1954 at the age of 50. 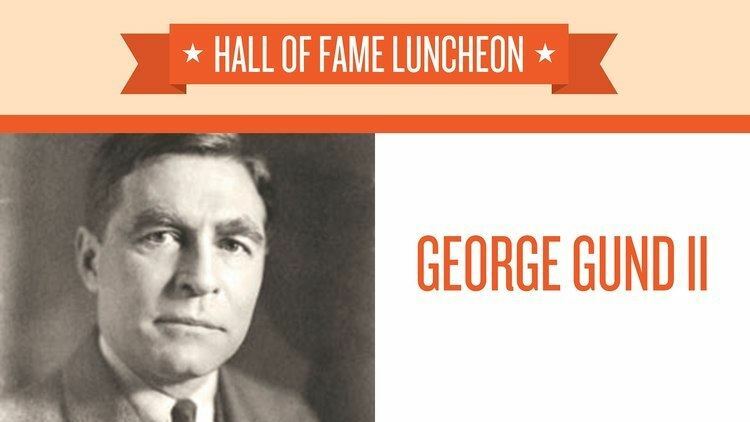 George Gund died of leukemia at the Cleveland Clinic on November 15, 1966. He was interred at Lake View Cemetery in Cleveland. Gund became a frequent giver of large charitable gifts beginning in 1937. During his lifetime, he was a generous contributor to the Cleveland Institute of Art; Harvard University, where he endowed two professorships; Kenyon College; and Trinity Cathedral, an Episcopal church in Cleveland. In 1952, Gund established The George Gund Foundation. His will bequeathed the bulk of his $600 million fortune to the foundation. Gund served on the Board of Overseers of Harvard University, was a trustee of Kenyon College, and was a member of the advisory lay board of directors of John Carroll University. He also served two terms on the Advisory Council of the Fourth Federal Reserve District in the mid-1950s. A number of buildings and places are named for Gund, due to his philanthropic generosity. Among these are: George Gund Hall at Harvard University Graduate School of Design, Gund Hall at Case Western Reserve University School of Law, and Gund Theater at the Berkeley Art Museum and Pacific Film Archive. George Gund III and Gordon Gund formerly owned the Cleveland Cavaliers professional basketball team and the San Jose Sharks and Minnesota North Stars professional ice hockey teams. In 1991, Agnes Gund was named president of the Museum of Modern Art in New York City. She stepped down in 2002. Graham Gund is the founder and owner of Graham Gund Architects, an architectural design firm based in Cambridge, Massachusetts. An award-winning architect and noted art collector, he has designed numerous important buildings and residences, including the Shakespeare Theatre Company's Sidney Harman Hall in Washington, D.C., and overseen numerous redevelopment projects, such as the refurbishment of historic Faneuil Hall. He is also a trustee of the Museum of Fine Arts, Boston. Geoffrey Gund teaches at the Dalton School in New York City and is president of The George Gund Foundation.